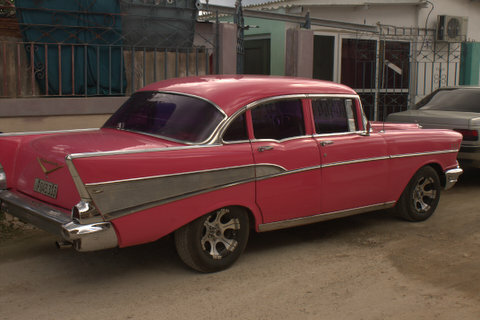 On our cruise to Cuba, with Viking Cruise Lines, we spent three days docked in Cienfuegos. 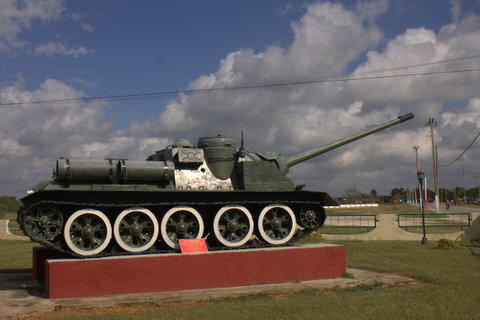 One of the tours available there is titled “The Cold War.” It is a trip to Playa Girón, where the Bay of Pigs invasion took place. This is a fascinating trip for those who are interested in history and who are willing to look at events through the eyes of another country, especially one with whose politics they might disagree. 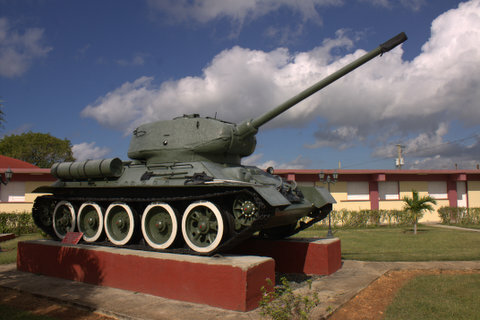 In 1952, the government of the United States backed a coup in Cuba. General Batista overthrew to elected government of President Carlo Prio. This move, backed by the United Fruit Company and ALCOA, the two major U.S. companies present in Cuba at the time brought about a terrible dictatorship, one that was brutal to most of the people who lived in the country. In response to Batista’s fascism, The Movimiento de 26 de Julio (The July 26th Movement) rose and took up arms. Led by Fidel Castro, this movement successfully expelled Batista and his dictatorship on Dec. 31, 1958. 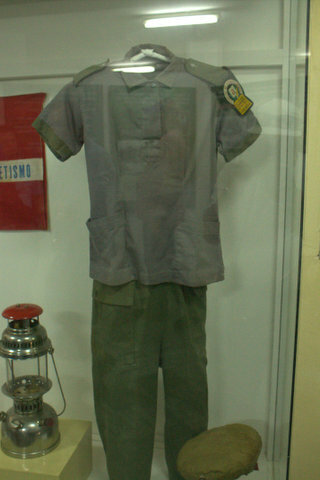 After the revolution many Cubans, especially those who were rich, or who been connected to the Batista regime, fled the country. These expats, with help of the CIA and Eisenhower’s government, made plans to invade Cuba and take control of the country back from the Cuban Communist Party. They believed that, with U.S. military aid and support from Cubans on the island, they would be successful. However, both of these assumptions proved incorrect. In 1960, John F Kennedy defeated Richard Nixon in the election for president of the U.S. Kennedy was much more cautious in his view of intervention in Cuba and dealing with Russia. This led the U.S. to cut the military support of the invasion. More importantly, those who had left the island greatly underestimated the support that the Communist Party had among the people of Cuba. Those who had supported Batista in Cuba chose to ignore the widespread poverty and brutality that his dictatorship brought to the poor and working class on the island. When the Communists came to power, they immediately put in policies to support working people. They provided food, and health care. They also trained thousands of young people to go out into countryside and educate the masses. These policies created a tremendous amount of support for Communist government. On April 17, 1961, a force of 1400 exiled Cubans, who had been training in Guatemala, landed along the Bahía de Cochinos (Bay of Pigs). The anticipated aid of U.S. bombers had been ineffective, at best, and gave warning to the Cuban Government that something was afoot. 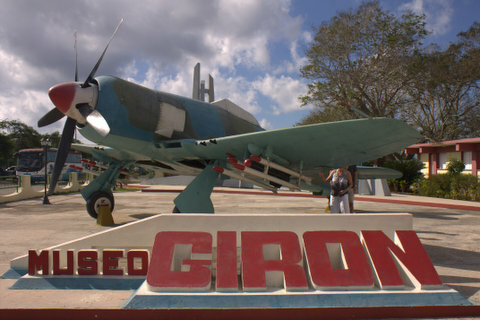 When the invasion force landed, they were met by both heavy fire from local militias and by bombing and strafing runs by the Cuban air force. 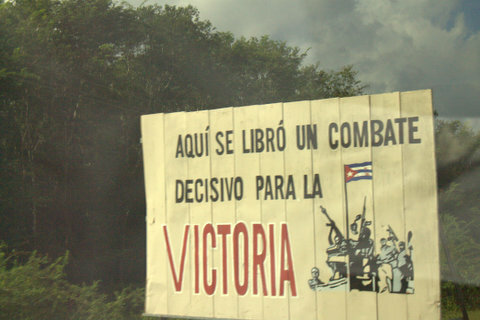 The Cuban forces were aided by local campesinos, who joined in the fight against the invasion. Within 24 hours, Castro ordered 20,000 troops to area, and the invasion was effectively quashed in three days. 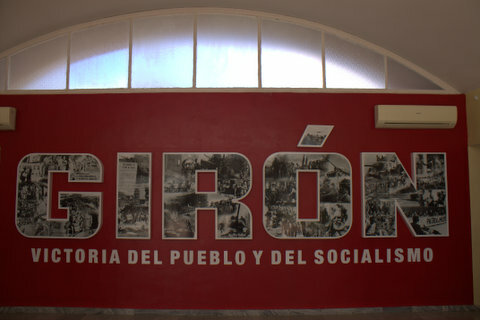 Today, in Playa Girón, there is a museum that commemorates this battle. It is a small tribute, given the significance of the site. 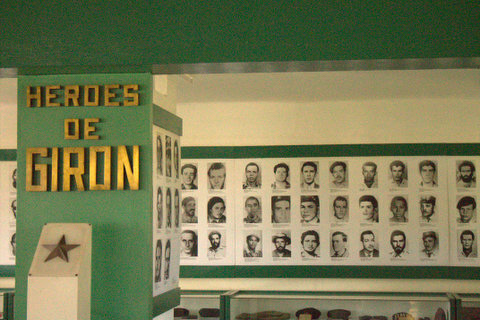 With a good guide or a knowledge of Spanish, it is a wonderful source of information and an excellent tribute to the Cuban patriots who died defending their country. 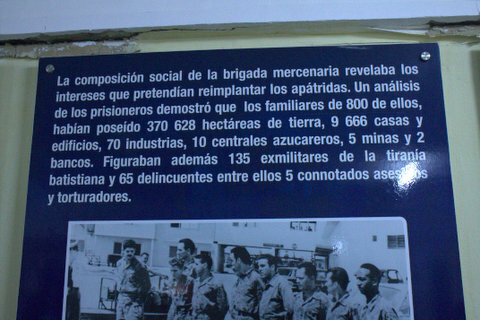 The exhibit begins with photographs and information boards that describe the conditions that existed in the area under the Batista regime. Our tour guide spoke passionately in her description of how difficult life was before the revolution, and how much it improved afterwards. She was passionate because this was the life of her grandmother and mother. 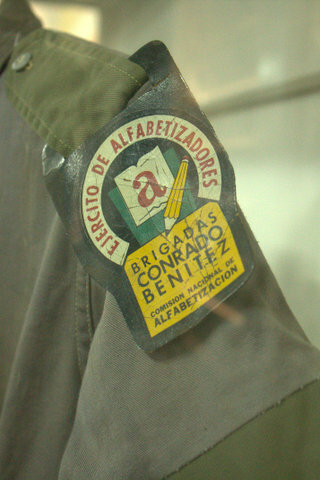 Our guide explained that her grandmother was illiterate at the age of 36, until Cuba’s Ejercito de Alfabetizadores (Literacy Brigade) came to Cienfuegos. In the span of two years the country’s illiteracy rate fell from around 50% to 4%, lower than any country in the Western Hemisphere. When the invasion took place in 1961, the expats entered a country that was significantly different than the one they left, just two years earlier. So, when it was time to choose sides, the locals strongly supported the Communist government. 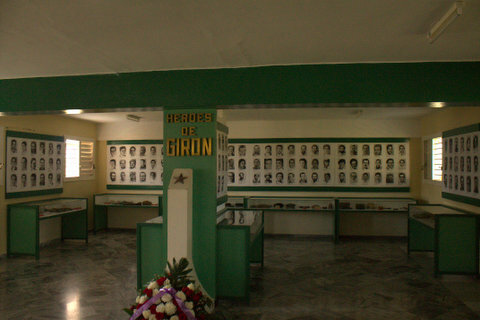 Half of the museum is dedicated to those who fought and lost their lives during the fight to defend their country. After exploring the museum, we walked down to the beach of Playa Girón. 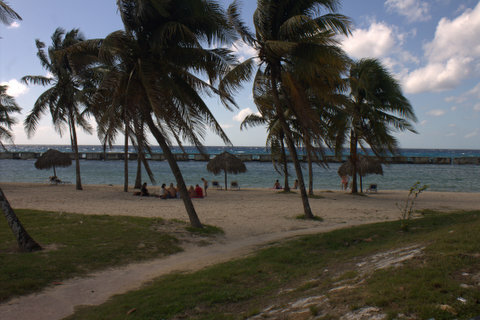 Today there is a hotel built there, but you can still look out to Caribbean Sea. From the beach we boarded the bus and headed up the bay to Playa Larga for lunch. 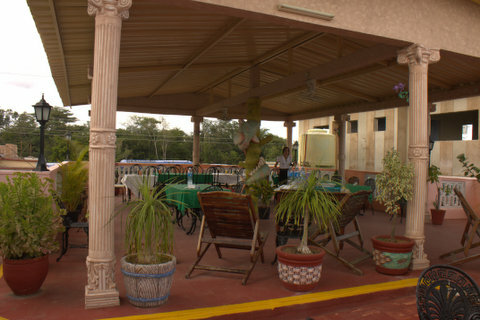 We ate at the rooftop restaurant of the Enrique Hostal. The food was fresh, delicious and plentiful. Then it was back on the bus for the ride back to Cienfuegos. The trip to Playa Girón was a fascinating journey back into a key moment in the history of the island, and of the United States. But it is one that should be taken with an open mind. Be ready to understand the point of view of Cuba. 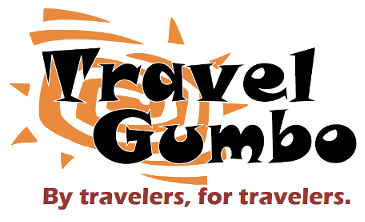 Be ready to question some of the beliefs that you might be carrying when you visit. Excellent coverage Jonathan. I served in West Germany during the Cold War and tensions were always high (but a better deployment than Vietnam). We (US Citizens) should sometimes take a look in the mirror when we we talk about Russians trying to influence our elections via the internet. We used to influence elections by just overthrowing governments we didn't like by force or by possible clandestine means.